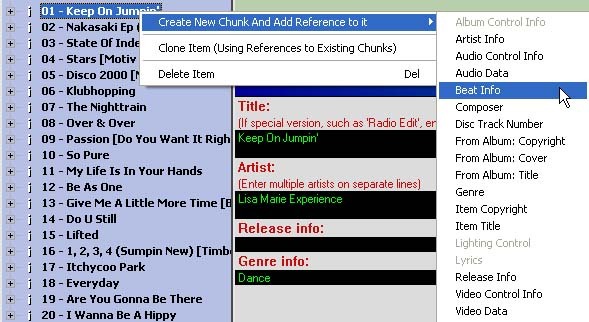 Any Ots item, including audio only, video and CD+G items, can have a beat chunk added to it, allowing it to be used with Automated Beat Mixing within OtsAV. Note: Automated Beat Mixing is only possible using Ots files. If you haven't converted your media to Ots files, use the Batch Conversion Tool. Note: To add a Beat Info chunk to all of your Ots files in a batch process, see here. 3. A summary of the Beat Chunk can now be seen on the right-hand side. The values displayed are set by default, however these will change to reflect the actual values once you have beat tracked the item. Re-initialize... button: Resets all values within the Beat Chunk to default values (not set). Edit... button: Opens the Edit Beat Info window.